Have you ever played a game that wasn’t a classic, but could have been? Like almost everything works, but a lot of things get in the way? We kind of have a lot of those games this last year, haven’t we? We had games like Dark Void, Alpha Protocol, Final Fantasy 13, Army of Two: the 40th Day, Spiderman Shattered Dimensions, and other games from the past year. What happens? Is it time? Is it the budget? No one really knows, but we all knew that they could have been great games. A very good example of this was an RPG coming out from Square Enix known as Nier. It doesn’t seem like this was Square Enix’s year was it? I mean, Final Fantasy 13 isn’t a bad game from what I hear, but it’s not what fans want. That is why I’m not touching it. However, I was looking forward to Nier, but sadly, it falls into the “almost works” category. Now, let’s get near - well, Nier, and take a look. The main story revolves around one of the oldest protagonists in the game industry name Nier, who lives with his daughter, Yonah. Yonah, sadly, has a severe illness that could possibly kill her. While searching for a cure, Nier runs into a magical book named Grimoire Weiss. Since Nier is in a world being tormented by evil beings called Shades, Nier has no way around this situation, but to stop the Shades to cure his daughter’s illness. After teaming up with the scantly clad female swordsman Kaine, and the powerful mage Emil, they set off the save the world. The story, while slow throughout the game, definitely has a lot of good moments, in my opinion, with some pretty emotional scenes that made me feel moved and attached to the game. Like I said though, it’s slow so I hope you have a lot of time on your hands. The gameplay in Nier is more along the lines of an action RPG. You only control Nier, but can give simplistic commands to your two teammates. Nier can equip two-handed swords, spears, and one-handed swords, but I would stick to the one-handed swords, since wielding a two-handed sword is asking for an early grave. The whole game is kind of set up like a Zelda game, but without the polished areas like Zelda has. I’ll explain later. Nier can also use the power of Grimoire to use multiple magic spells, like making lances, giant fists, and rapid fire beams of magic at the enemy, but most of the time, only one or two spells really work out through the entire game. You can also do multiple side quests for the villagers, like getting letters, slaying animals, slaying animals for food, and getting food for people. The game can take 20 to 25 hours to beat, so you are looking at a lot of playtime in this game. During different parts of the game, the gameplay changes a little. One time you’re going through a level like an old-fashioned 2D action game, and then you’re going through a level like Lara Croft and the Guardian of Light. It definitely has a lot of variety. The whole look of the game is nice with creative monster designs and main character designs giving a lot of variety. Granted, the enemies usually look like something from Twilight Princess, but overall, they are not bad looking. The landscapes are somewhat beautiful to look at. One of the high points, though, has to be the music and voice acting. Takafumi Nishimura composes the music and the vocals are voiced by Emi Evans, who does a wonderful job with the music. It’s all very fun to listen to and sounds pretty good. Voice acting isn’t half bad with voice talent from Jamieson Price, Laura Bailey, Liam O’Brien, and Julie Ann Taylor who usually do a good job with the lines they are given. I also like the small bits of humor they throw into the game. I think one of the weirdest things here about this game is how long it has stuck to me. Sometimes, after playing different games, they don’t usually leave an imprint on my mind or anything, but NIER is different. I think out of this past year, it is one of the top 10 games that has been stuck in my mind after playing it. Sadly, this game has a lot of rough areas. 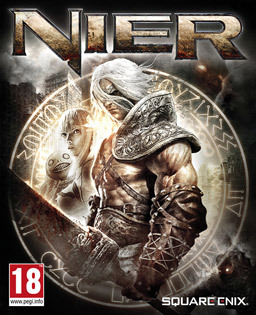 Like I said, the look of Nier is somewhat beautiful, if it was released in 2007, but now in 2011, it is pretty dated. It is not PS2 quality, but it looks like PS3 and 360 launch titles. I think the visuals could have been better if this game had been released years earlier. However, there are a lot of bland and flat textures, and for some reason during cut scenes there are bars on the top and bottom of the screen that are distracting. The controls feel stiff and wonky. They don’t really get in the way until the end of the game where it’s crucial to have perfect platforming and running controls. This will cause many gamers to get frustrated and annoyed. The side quests are basically pointless and repetitious with 99 percent of the side quests being the same thing every time. While I like the humor of the game, it kind of detracts from the main story, which gets lost at times. My final complaint is that when being released here, the in-game character Nier is actually different from the Japanese version. The Japanese version is much younger and looks like someone from Final Fantasy. What is the point of that? I mean, would we really think differently if the character were 22? I don’t mind the older Nier, but it just puzzles me sometimes, looking at the two side to side. I have read that it’s due to a relationship thing of Yonah with the US version being the father and the Japanese version being the older brother to Yonah instead of the father. Why would they do this? It sounds like they had a big budget but used half of it to make the two separate games. So, that is my review of Nier. What is my final conclusion? Well, out of all the disappointing games of 2010, next to the new Spiderman game, this one has the least amount of disappointment. It almost works. The character designs are not that bad, the voice acting and the music is pretty good, and the story has some pretty dark turns and is overall enjoyable. While that is said, this game does have some pretty rough edges and just hits the line on underrated gem and above average game. It’s a little bit of both, and it is definitely worth checking out since this was the last game made by Nier’s developers, Cavia. I just wish there would be a sequel, since it definitely has much more potential than other games I have played in 2010. However, this is a new year, and I still have a lot of games to go through.